As if potty training itself wasn’t stressful enough, when a child has a “potty training regression,” you can feel like the rug has been pulled out from under you. You have lived the dream of no diapers and suddenly you are left cleaning up accidents in underwear. The accident can have spilled onto the floor or couch… and this cleaning obviously is a much grosser and longer process than just changing a diaper. Let’s be clear. A true regression is different than an accident here and there. Accidents can and most likely will happen. Your potty trained child can get so engrossed in playing that he/she forgets to go potty. You child can simply forget he/she is actually in underwear and not a diaper. Your child might have just waited a bit to long to make it to the potty in time. Just like a child who has been walking for a couple of years can trip and fall, a child who has been potty trained for a couple of months can have an accident here and there. We also aren’t talking about a child who has never truly been potty trained continuing to refuse to move beyond diapers. We are talking about a child who was potty trained but is now having accidents multiple times a day. So how do you get a handle on the situation? 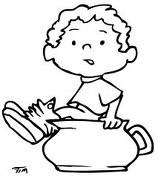 There are many possible reasons for a potty regression. Transition: The most common reason for a true regression is a big transition. Toddlers and young preschoolers often have potty regressions when a new sibling comes home. It can be a new school, mom going back to work, moving, etc. Think through life and see if your child is facing any big changes in life right now. Constipation: If your child has a hard time pooping on the potty, he/she might avoid visiting the potty because the potty starts to become associated with pain. Bladder Infection: This is along the same lines as the constipation. Stay positive. Scolding potty accidents is very rarely a helpful reaction. Chances are your child will feel bad about the regression, and that feeling can be expressed in a variety of ways from deciding potty training is stupid to hiding out. Be supporting and encouraging. Focus on being clean and dry. This method is discussed in Potty Wise. Success isn’t just in peeing or pooping in the toilet. It is also in staying dry. If your child is not putting effort into staying dry, offer small rewards for a time for being dry. Randomly ask, “Are you clean and dry?” Check. If the answer is yes, offer a small treat or sticker and cheer your child on for staying dry. Require potty breaks. If your child is having regular accidents because he/she can’t accurately predict how long it will take to get to the potty, institute a regular potty schedule and stick to it. Go back to diapers. If your child really can’t handle underwear for now, just go back to diapers and return to underwear when life settles back down. Healthy diet. Make sure your child is getting enough water and foods that help move along bowel movements. Good hygiene. Keep things clean. Help your child stay wiped and clean to avoid infections. Just keep trying. Setbacks are common for children in all areas of learning. Your child may have had her ABCs perfect last week and this week seems to thinks she has never heard of letters. This is common for children. Just stay patient and keep on trying.